I’ve been part of the SatAM community at large for about two years now, and a SatAM fan for as long as I can remember. And in part, I owe that, and all the wonderful things that have come about in my life because of it, to Ben Hurst. We all do. I don’t mean to deisize the man, an act of supreme disrespect if ever there was one, but it’s true. The point of Art, after all, is to ripple out into the world, to effect things in ways both big and small, and in his contributions to SatAM and to all the projects he worked for, Ben Hurst did that. His love for the world he helped create and the characters he helped define became our love, and that is not something to be taken lightly. So thank you, Mr. Hurst. Thank you for everything. Ben Hurst wrote for a show that I loved watching as I grew up. I was first introduced to Sonic when I was a toddler back when the games were new. Around Sonic 1 or 2. And close to my preteen years, I found SatAM and quickly fell in love with the show. Sally was my favourite female character, with Sonic, of course, being my number one favourite. To me, they were the ideal couple, and it thus inspired me to write some fanfics and draw some pictures. Some of which sucked and I’ll likely never share with the general public. To this day, I still draw some SatAM artwork and in more recent years I incorporated some SatAM elements into a few Sonic fanfic’s which also had some elements of Sega things in there too, but that’s beside the point. SatAM inspired me to open a website. The very first website I ever had was dedicated to SatAM. And I idolized Sally’s character as a young girl. And even now due to my love of the series and characters, I voice act for a few projects as Sally. That’s not a plug, if anyone thinks that. At least not an intentional one. And like I said yesterday, SatAM is the reason I found FUS. It’s the reason I’ve created bonds and friendships with wonderful people here that I intend to carry through life with me to the end of my days. So SatAM did impact me in a big way. Ben Hurst has had an impact on my life. This is a terrible loss, and he will be sorely missed. I think I can speak for FUS, perhaps the entire SatAM community, when I say that even if a SatAM revival never comes about, we will carry on the SatAM legacy. It will still be with us as long as we never forget and as long as we remember Ben’s part in this. Like I said on my youtube, Ben is one of the people who made SatAM what it is, and we will always be grateful and thankful for the impact he had on the show as well as the Sonic fanbase. I’m saddened Ben has gone, and even though I, myself, am Agnostic, I know he is in a better place, and I am happy that he went in peace, as he wished. Thank you, Ben, for giving us this wonderful show that has brought us together. We will certainly keep you in our hearts as you kept us in yours. Shall you never be forgotten. It was actually an episode of the show he wrote that got me hooked on it in the beginning. I never knew when most cartoons came on as a kid so I missed out on the show. It wasn’t until the internet that I saw the series in full. I was a growing fan of the games so when the shows came out I was happy as a kid could be. Tho, when it came to the sonic and tails show I never really got into it. It was nice and goofy but something just didn’t click with me. Then when I found out of the other show, SatAM, it immediately became my favourite show I never watched. My first glimpses were catching the tail ends of Sonic’s Nightmare of him escaping the collapsing city and his funny hairdo. I knew in my mind from this 5 minute peak it was something special. Then my mother was up very early one morning and it was on and decided to tape the episode for me, Sonic and Sally. This episode, was always my favourite. Everything felt like watching a half hour movie. When I watched the intro with the strangely fluid animation and detailed designs it really felt like a big budget animated picture. Watching the episode Sonic and Sally became one of my happier highlights of my early youth. The characters felt real to me like I could understand and care for them and had my first crush on Sally since I was so much like Tails back then. I think it was from watching this show, because of him that he influenced me to become where I am with my artwork since ever since those magical moments of the show, I never put down my pencil drawing Sonic. Over the years I’ve learned to draw different and more complex things from different sources but Sonic…SatAM, was always my founding root of undying inspiration. Even today, when I look at the episodes he worked on I feel that master craftsmanship of storytelling which in this day and age, is very hard to tell in under 20 minutes with a young audience. I did speak to Mr Hurst once when he visited this site. Sonique gave us all a chance to tell us what we thought of the show to him. I don’t recall much of what he said but he seemed quite pleased that I had such a appreciation for his work. Tho he did say he forgot what the episode Sonic and Sally was about and said he was gonna re-watch it to refresh his memory. I am glad we got the Sonic SatAM dvd released since he is now immortalized with the franchise so future generations will know who the maestro was who did these great episodes. I think it was because of Mr Hursts and Alice’s relationship that this fandom has gotten as far as it has. The founder of the lighthouse for the franchise with the blessings of a man who helped create it. Thank you Ben Hurst for the great times. Ben Hurst was a one of a kind writer. I seriously can’t remember the last time a writer was so dedicated to a television show. I thought of him as not just a brilliant writer, but a nice guy all around. I have loved SatAM for a long time, I even wrote a letter to Cartoon Network. Whenever I watch, talk, or think about SatAM, I will always think of Ben Hurst. He gave us a truly wonderful piece of animation that has managed to stay alive in the minds of many, and now I hope that we will always think of Ben Hurst. So I send my prayers, and say for the last time; Thank You Ben Hurst. Not just for this show, but for being an all around good guy, and bring us fans together. Thank you Mr Hurst. I could talk about the first episode of SatAM I ever saw. But it’s not much of a story in all honesty. I’d seen an advertisement for it in Sonic the Comic’s poster mag but, when it didn’t seem to air, I began to doubt it actually existed. And who could have blamed me? I mean, there was also an advertisement for a cartoon which involved Sonic and the Freedom Team! Imagine if that had been produced, there’d have been three Sonic cartoons running simultaneously! But I digress. The point is, I put on the television one day and caught the few minutes of an episode I’d later come to know as Sonic Boom. That in a nutshell was my first experience with the show. Big whoop. What’s an even bigger deal was my later brush with the episode which I’d come to view as my favourite if not the best of the entire series. Sonic and Sally. Not just because it featured Tails, my favourite character, but because that episode really speaks to me. In a none schizophrenic sort of way, of course. Basically Robotnik creates a robot double of Princess Sally and the impostor fools everyone but Tails who sees it through the eyes of a child and realises that this is not the person he loves as a mother. And what I take away from that is this; no matter how deadly and sophisticated Robotnik’s machines will become in the future, the Freedom Fighters will always find a way to win through. The smallest of them brought the doctor’s evil plan tumbling to the ground simply by listening to his heart. So if they remain true and stay united, there’s no way he can beat them. Because whatever his machines have in weaponry and AI, they lack one important thing. Hearts. Hearts of their own which are fuelled not by oil but the reasons they have to fight this battle. Bunnie even says as much at the end of the episode. Well, perhaps not like that but still. And that’s what not only this episode but the entire series is about. How powerful a heart can be. And how unstoppably powerful many can be when they’re brought together. It’s telling that, in another episode written by the same writers, Snively says that Robotnik has no heart. And look what happens to him at the end of Season II. Despite all his power and weapons, he’s lost every battle. As long as the Freedom Fighters keep fighting for their freedom, he’s already lost. And this is all coming from a cartoon. A cartoon based on a video game. About a spiky animal that runs really fast. This was the first episode Ben Hurst wrote and it set the standard for the rest of an epic series. He was a master and the world is lessened by his departure from it. So if anyone wants me, I’ll be watching my Complete Series DVD set. I may have only talked to Ben once, but through SatAM, he became an important part of my life. I hadn’t even realized that until now. Thank you. You’ll be missed. Ben will be dearly missed. Even though I grew up with sonic x it wasn’t until recently when I started watching old episodes of SatAM that sonic started to dominate my life and for that I thank Ben Hurst. Goodbye Ben, we will miss you. What Ben did as a writer though has had tremendous impact. Allow me to use a quick analogy here. You have probably heard that smell is the strongest sense tied to our memories. A simple whiff of something can instantly transport us to an earlier time or memory. This is kind of how SatAM has worked for me. A simple quote from Ben’s SatAM writing or a small clip from the show can quickly bring me back to an earlier (and happier) stage in my life, childhood. So here’s to you, Ben. What you have done has created great memories for all of us in the SatAM community. May you rest in peace. Sad to hear that Ben is no longer with us. Thanks Ben for creating a wonderful cartoon that both kids, and adults can enjoy. May you rest in peace. Such a tragic loss. Ben Hurst delivered one of the most memorable shows of my childhood. Rest in peace, Ben. That’s very sad, especially someone as young as 50, that’s way too young to go. From the way you described about him, Nique, he sounded like a cheerful and happy guy. I saw that in him when I saw his interviews on the DVD. In the words of General George Patton, “It is foolish and wrong to mourn the men who died, rather we should thank God that such men lived.” We should all be happy and thankful with what Ben gave us. For a happy personality like his, he’d probably want us to remember all the greatness he gave us. He has written us unforgettable Sonic episodes and moments that will forever live in us. 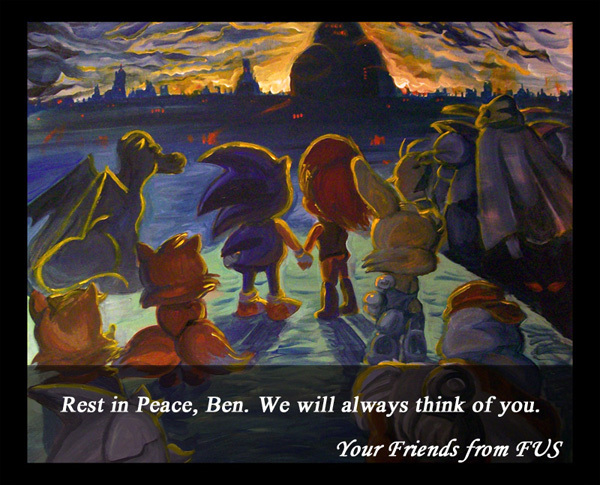 As long as we remember what he has done, what he gave us, and everything he has worked hard for to get another season of SatAM, if we all remember that then Ben Hurst is not dead. He is still with us, even as I type this, and even as you read this, he’s still with us. He’s with Dana Hill right now. My condolences to the Hurst family, I know exactly what it’s like to lose someone. Thank you, so much, Mr. Hurst. You have given us Sonic and Sally, Sonic Conversion, Game Guy, No Brainer, the Blast to the Past episodes, Dulcy, The Void, Ro-Becca, Cry of the Wolf, Drood Henge, Spyhog, and finale The Doomsday Project. Rest In Peace, we shall all miss you, but we will never forget you. This is some of the saddest news i’ve gotten in a while. I just was checking the board on a whim, and now I kinda want to cry a little. Ben, i’m saddened to have never met you. You were an inspiration to a generation of fans the world over, and I believe I safely speak for all FUSers when I say that we love you and will miss you a great deal. Nique, of everyone on FUS I give you my condolences. 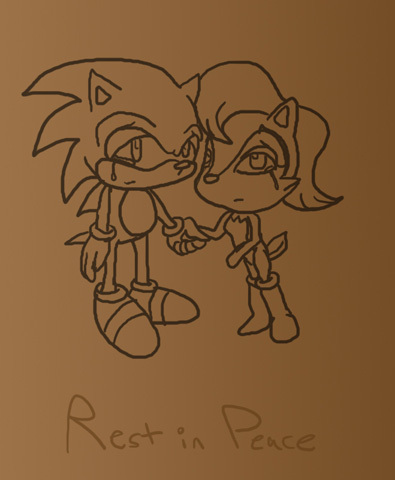 The father of SatAM and the matriarch of FUS, i’m saddened for your pain, and I wish you peace. Ben’s the reason I got started writing fanfiction, and after watching the episodes he wrote again, my writing instantly improved. We as a fanbase will never be able to repay you for all the joy you’ve brought us over the years, but hopefully this forum’s fruits will be a suitable place to start. This is a really sad day for me also. I live in Sweden and saw this show during the 90’s only a couple of episode and i loved them. But today i am a huge fan of the comic and the show. And i can say i will miss Ben Hurst but i don’t think he would want the fans to give up hope for season 3 just because he died. He would probably want the fans to continue to try to make that dream true. PS: Please excuse my grammar. SatAM was the initial reason I became a Sonic fan. The engaging storylines, endearing characters, and beautiful animation is what hooked me on the blue hedgehog. My fondest memories of Ben Hurst is in 1998 when SonicHQ posted an interview they conducted with him regarding his proposed Season 3 feature film. I remember combing through the article and acknowledging the passion and dedication he conveyed. He mentioned about several contingency plans if his efforts failed. Direct-to-Video movie or a written profic. At the time, I was a senior in high school and ambivalent of my career goals. After reading Ben’s interview, I felt compelled to contact him just to wish him luck with his plans and express my devotion to the wonderful show he created. Upon receiving his correspondence, he asked me what my goals were and I told him I wanna do something with Sonic but I dont know where to start. The advice he gave him changed my life and ultimately steered me in the right direction of my career path. Because of Ben Hurst, I decided to enroll at an art university to major is animation, graphic design, and creative writing. I earned my BFA degree in 2005 and immediately contacted him to tell him of my accomplishments. The question latter prompted was in regards to collaborating on a Sonic movie since it was one the only major project I wanted to engaged in after college. Even though he polity declined, he was still the source of motivation in getting it finished. I thought it was really humble of him how he joined in community chat sessions to answer questions about his work, especially Season 3 of SatAM. Probably the most honorable mention is how he was willing to appear on the SatAM DVD boxset. Its the appropriate capstone to the SatAM and everything hes given us over the years. SatAM fans cant deny that Ben Hurst was a treasured icon of the community and his legacy will live on in the hearts of all devoted fans. Rest in peace, Ben Hurst. I loved your show growing up, and I’m sorry you never got to see your third season come out. I sure would’ve liked it. I was and am still as fan of SATAM.The news of Hurst passing is shocking to say the least.His contributions to the most amazing cartoon series I have ever seen sense.He will always be remembered.Like in the series he has entered into “The Great Unknown”.SATAM will still be in our hearts and minds.It a series I will never forget. Ben Hurst… what can I say about him… only what I truly know of him. How I saw him as. Sent from heaven. What he has written in Satam will always be the cornerstone of storytelling in my entire childhood, and I believe that no one will ever be able to show me that I am wrong. Ben was an inspiration, helping fans to try achieve their goal… this I have also embraced and been dedicating myself to help fans just like he. His work has really touched my heart, body and soul. Buying the boxset on launch, I was not prepared for the interview that Ben had done… he showed so much love and respect for us, and despite so many setbacks with Satam he never gave up. He believed in Satam, and by also believing in us fans, we knew at heart that he is no ordninary man… no stereotype writer that was trying to gain a quick buck from a dying franchise on DVD. Ben was someone that had the same beating heart as us, and lived through the episodes just like we did. Sadly, that heart stopped beating and not living anymore. We lost someone very dear to us. No matter if it´s a few teardrops or a tsunami of tears, Ben Hurst will be remembered by those that also respected him, believed in him and loved him. His family. His friends. And his fans. Rest in peace Ben, may you from up high see not only the love you have given us all, but the love we are giving back to you. and I have Ben to thank for making my childhood what it was. Thank you Ben. May you rest in peace and your memory live on for more years to come.